Christy "The Amazon" is not your ordinary woman. A goddess of 6'1”, she will not only stop you in your tracks, but that gorgeous woman will make your heart pound right out of your chest. Her performance will mesmerize you, whether through her sensual fire eating, light-hearted hula hooping, or powerful dancing—your soul will be hers! Christy has worked across the country in nightclubs, at private events, public parades and city gatherings, fetish parties, variety shows, strip clubs, and fundraisers. With her stunning height of 6'1” and yet more stunning skills, she never fails to captivate a crowd. Christy's passion for art, sexuality, and self-expression fuel her work as an artist in the industry, and simultaneously instills in her audience a desire to experience life from a refreshingly creative and sensual perspective. 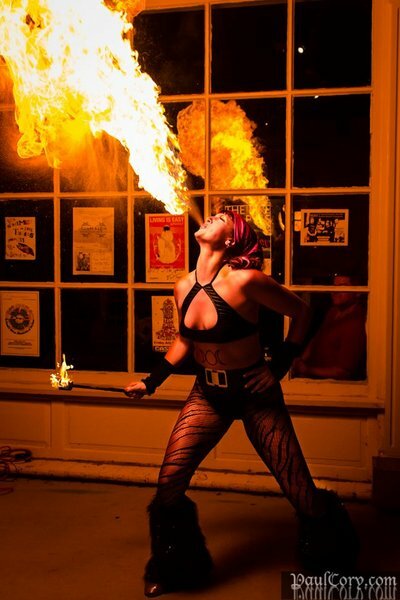 Contract performer, travel up and down East coast, performing fire at private events. Independent contractor working under Pure Talent agency to perform at men's clubs and casinos in the U.S.A. and abroad. Developing various performances and performing 2-3 shows nightly at venues. Booking travel, creating costumes, and communicating with venue contacts are all part of the deal, along with actually performing and interacting with patrons. Developing and teaching pole fitness classes, performing at events, promoting.